The 5 minute reflect and reenergize period in the end is important too. Doing a quick reflection when the execution is fresh can be useful in correcting mistakes and planning next steps. The relax and reenergize (sometimes achieved through quick meditation) can help in the next pomodoro. This obviously requires practice. We are naturally tempted to distractions – both external and internal. Without conscious effort, our mind will wander off thinking what is irrelevant to present or do something of little value. Techniques like pomodoro are meant to instill a conscious effort and discipline to ensure that we get the most value out of our time. Try playing around with the length of Pomodoro. For me, 25 minutes is too short for some complex tasks, specially those that require thinking and analysis. I can effectively work up to an hour. It can vary for person to person so you will have to find your own sweet spot. However, anything above 90 minutes would probably start getting ineffective. As you are in a pomodoro, you will continuously be nagged by your unconscious to distract you – check Facebook, read that new email, check your cell for new messages, think the most irrelevant thing. Thats natural. What is ineffective is to give into these. One way to avoid it is to note down any distractions that come your way – externally or internally – and keep moving with your Pomodoro. 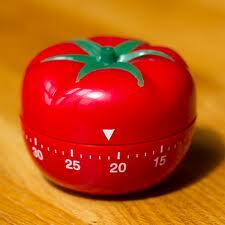 Once your Pomodoro is done, you can go through the list of items that you were pestered with. You will realize they were not really worthy to do at that time. Secondly, you can attend to them now without missing out on any. You may consider reading my series of GTD posts. It is important to clearly define your Pomodoro objective before starting it – write the first draft of the post, collate the data to generate the quarterly report, think about the two options for the company event, review and comment on the document sent by Alex. It has to be specific and clear. The more vague you are, the less effective you will be. Schedule the Pomodoros on your calendar. Pomodoro is just like any other habit. It takes practice and persistence to develop it. Keep at it – it takes on average 21 days to mature a habit. This entry was posted in Productivity, Time Management and tagged Time Management. Bookmark the permalink.